How often have you woken up with a puffy face? Do you find that your face looks pale in the early hours, and even into the afternoon and evening? Do you look tired, even after hours of restful sleep? Your facial skin can be a fickle creature, but you are not alone. There are many people who do not like the look of their skin in the morning. It looks different, and it feels different. It is one of life’s little mysteries. Why does our skin looks tired and stressed when we have rested for so long? There must be something which we can do? Many people try various solutions. From face masks and creams to expensive make-up and plastic surgery. All in search of perfect skin and a youthful complexion. Often these solutions serve to make the problem worse. So, is there anything which we can do? Well, we may just have the answer. Hiding the problem is not the solution. If you sweep your dirt under the rug every day, there will come a time when the dirt will spill out, and your problem is ten-fold. The same is true for trying to cover up your skin problem. Let’s take a look at the root of the problem. When we look at issues such as paleness and puffy faces, we know that there is a culprit hiding. Poor circulation. Poor circulation can cause this and more. Spots, wrinkles, dull skin, sagging, small pores, and tired skin. We need a hero to step in, and we have just the one. Tanaka is a Japanese facial massage. It can improve your circulation and fight all of the problems we have mentioned. There are many facial massage techniques, but we have found Tanaka to be our go-to massage. We can tell that you are sceptical. Check out these four videos and try it out for yourself. When you are done, you will be amazed at how your face feels. As you can see, Tanaka massage does take some time when done properly, but what are a few minutes in exchange for radiant skin? Try the Japanese facial massage technique once a day for two weeks and you will feel like a completely different person. We cannot get enough! The Tanaka massage is a massage which focuses on the lymphs, flushing the waste from our lymph vessels. Less waste means a firmer face, with less puffy skin. By massaging from the ears down to the neck and collarbone, you are flushing out a lot of toxins. This is a great starting point. With a few simple movements, you can flush out a lot of toxins from your skin, and begin to relax and soothe your facial skin. Parotid lymph nodes are located in front of and behind our ears. These nodes can affect facial skin immensely. If they are not taken care of, then your skin can swell and become less firm. When you massage your cheeks and push them in an upward direction, you are reducing the fat and cellulite in that area. Our tip, when massaging your cheeks, is to be firm. This is not a massage to immediately relax your face, it is one to stimulate it, and you need to apply pressure if you are going to remove the fat. Massaging around the nose will help to lift the skin in that area. When we watched the videos, we found the technique to be rather simple (as long as we followed the method exactly). We liked that it took a relatively short amount of time. With a little practice, we were able to achieve the desired effect in five minutes. What is the desired effect? We have talked about how you should perform the massage and why. You will have watched the videos and seen how to perform the massage yourself. What we want to mention, is how you should feel at the end of the massage. As we have said before, this massage is not one which will relax the face. You should apply pressure to your face as you are massaging. The end result should not be one of pain, but it should also not feel as if your face has not been touched. Aim for a tingling feeling when you are done. This massage can be done daily. We would recommend first thing in the morning or last thing before bed. 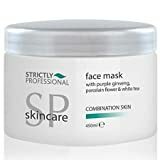 We would recommend a facial cream which does not absorb into the skin too quickly like Strictly Professional Facial Massage Cream. If you prefer, you could also use a facial oil. Two of our favorites are sweet almond oil and coconut oil. Q: I do not like this massage, what else can I try? If you prefer a more classical face massage, then check out our review of the best facial massagers on the market. You could also try one of these facial massage tools.